Although K-pop has been around since the early 1990s, 2018 was the year it really took off globally thanks to social media. This year on Twitter, Instagram and Facebook it was hard to avoid Korean pop groups like EXO, SEVENTEEN, GOT7 and most famously, BTS. 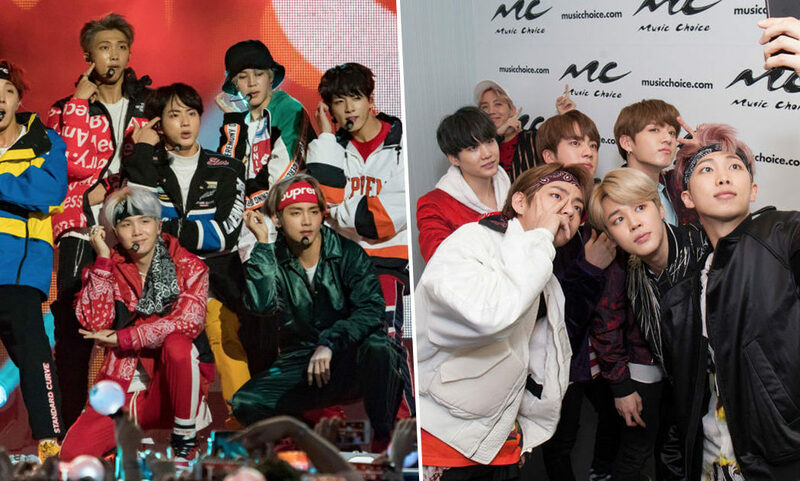 The cultural global spread of Korean entertainment including K-pop, known as the Korean wave, was truly unstoppable in 2018 and BTS led the way. For the uninitiated, BTS, also known as the Bangtan Boys or Beyond The Scene in a 2017 retconned rebrand, are a South Korean boy-band made up of seven singers and rappers – Jin, Suga, J-Hope, RM, Jimin, V and Jungkook. While BTS have always been popular in their home country this year they took over the world and became the first Korean group to go platinum (1,000,000 plus units) in the United States with their hit single MIC Drop. 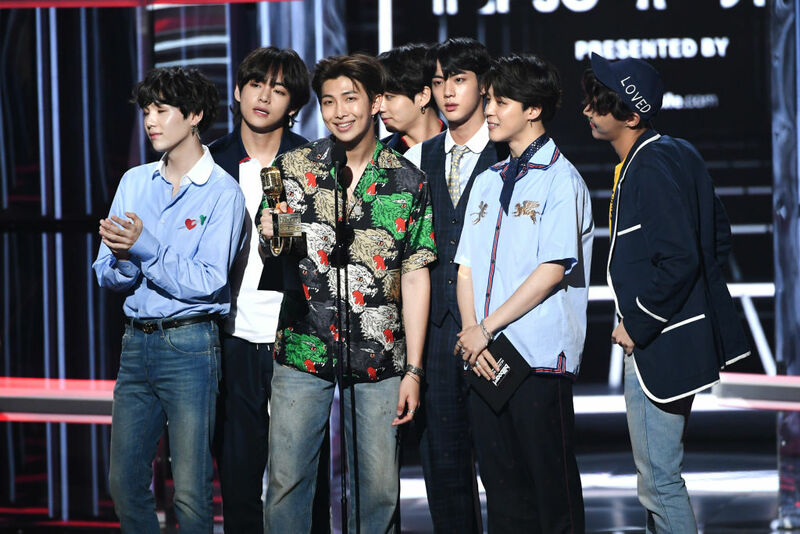 The secret to their global success is social media as the group reigned king in 2018 leading Billboard’s Social 50 chart for the entire year. Billboard’s Social 50 chart ranks artists according to how popular and active they are on social media, their own websites, YouTube and Vevo. Landing the number one place for the first time in October 2016, BTS was rarely seen from the top spot spending, at time of writing (December 24), 105 weeks there. For the entire 2018 chart year (December 2, 2017 to November 17, 2018) BTS held the number one consecutively with their reign beginning the previous chart year on July 19. Billboard describe BTS’s achievement as being ‘no fluke’ explaining just how much emphasis the group puts on social media. BTS’ second year at No. 1 on the year-end Social 50 list (the group ruled 2017’s and came in at No. 2 in 2016) comes amid a big year for the boy band overall. In June, it scored its first top 10 on the Billboard Hot 100, with Fake Love bowing at No. 10 on the June 2-dated tally, the first K-pop song to debut in the chart’s top 10. Three months later, Idol, featuring Nicki Minaj, entered the chart one spot below at No. 11 (Sept. 8). Additionally, BTS became the first K-pop act to lead the Billboard 200, doing so with Love Yourself: Tear in June and again in September with Love Yourself: Answer. 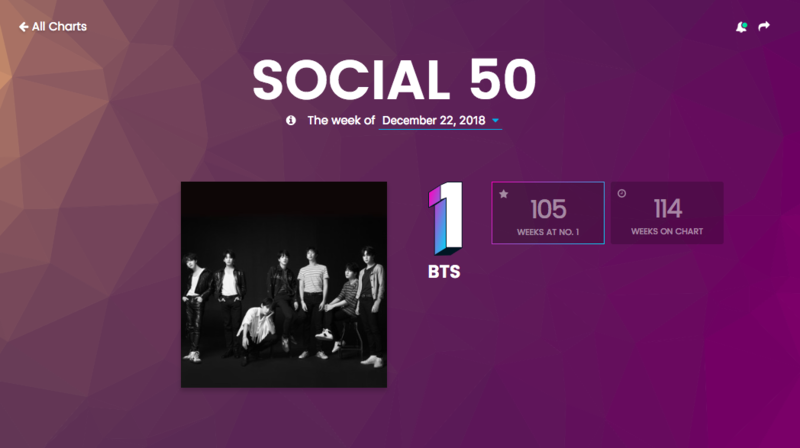 So BTS has been busy in 2018, meaning the group’s rule of the Social 50 has been no fluke. The act has been active each and every week on social media, routinely scoring millions of mentions and reactions on Twitter alongside thousands of Wikipedia views. And as BTS’ star continues to rise, so do its followers on social media, further expanding the group’s reach. BTS do have some competition though from other K-pop groups with EXO chasing them by climbing the chart currently standing in the number two spot. And then at number three is fellow seven member South Korean boy-band GOT7 with K-pop group NCT in ninth place. It doesn’t look like K-pop groups will be leaving the top spots of the Social 50 any time soon.